Reading, PA, May 2, 2017	(Newswire.com) - In coordination with managing their digital marketing to reach new patients, DaBrian Marketing Group noticed that Grove Dental Group’s website needed a new layout and structure to rank higher on search engines and improve usability. Grove Dental’s precise branded guidelines made the redesign of their website a simple project without complications. Grove Dental concretely identifies its brand — from the personnel’s attitude and level of patient-engagement to the overall mission of the company. 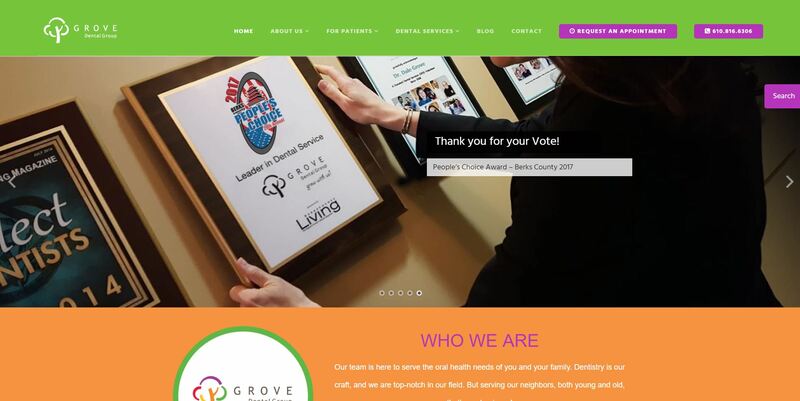 This allowed DaBrian Marketing Group to create a layout and structure that effectively communicates Grove Dental’s digital brand to potential patients. This redesigned website complements the organic (search engine optimization or SEO) and paid (pay per click or PPC) search engine marketing efforts, as well as the social media marketing efforts that DaBrian Marketing Group continues to perform for Grove Dental. Founded in 2008, DaBrian Marketing Group, LLC is a full-service digital marketing agency, focused on providing original and strategic digital marketing solutions for businesses that want to create digital awareness, increase return on investment (ROI), and identify insights that not only will help achieve goals but will also help to increase your business's efficiencies. DaBrian Marketing Group’s services include email marketing, digital branding, search engine optimization (SEO), Pay Per Click (PPC) Advertising, web design, web analytics, social media marketing, and more. Company headquarters is centrally located at 500 Penn Street, Suite 201, Reading, Pennsylvania 19602. For more information about DaBrian Marketing Group, visit dabrianmarketing.com or call 610.743.5602.